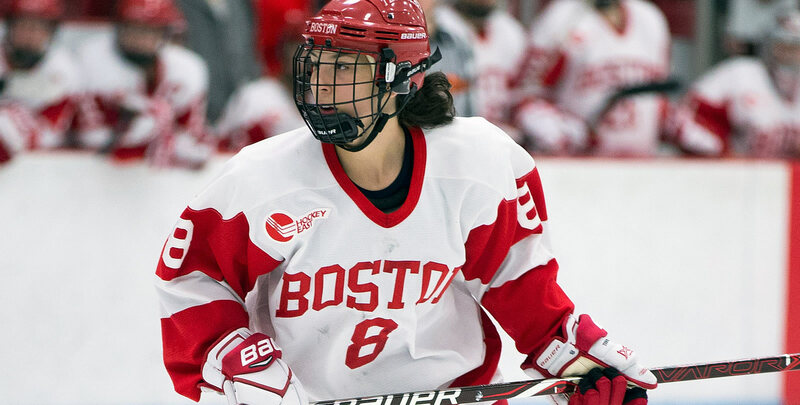 BOSTON - Seven different Terriers found the back of the net as the Boston University women's ice hockey team defeated the Durham West Jr. Lightning, 7-0, in an exhibition contest on Friday night at Walter Brown Arena. Redshirt junior Abbey Stanley, junior Deziray De Sousa, redshirt junior Sammy Davis, junior Natasza Tarnowski, sophomore Kristina Schuler, freshman Courtney Correia and sophomore Jesse Compher all lit the lamp for BU. Sophomore Rachel Allen added two assists, while Compher, De Sousa, Correia and Davis each had an assist as well. - Stanley opened the scoring at the 6:58 mark of the opening stanza on the Terriers' lone power play of the evening. Senior Reagan Rust passed the puck to Stanley at the top of the zone, and the redshirt junior uncorked a shot past the goaltender. - De Sousa added to the lead with 4:45 to go in the period when she collected a pass from freshman Kaleigh Donnelly in front of the net and quickly backhanded the puck into the left corner. - Davis made it 3-0 at the 18:38 mark when she skated around the Durham net, quickly changed direction at the half wall and then cut to the slot before roofing the puck home. - Tarnowski began the scoring in the second frame at the 4:25 mark off a feed from freshman Alex Allan. - Schuler extended the lead to 5-0 at 7:38 of the period thanks to a nifty move. With her back facing the net, Schuler caught a pass from junior Abby Cook, turned and then fired a shot into the top right corner. Freshman Mackenna Parker also assisted on Schuler's goal. - Correia made it 6-0 at 13:43 of the third period when she finished a rush that started with Allen and Davis. - Compher completed the scoring with 5:41 remaining in regulation off a pass from junior Breanna Scarpaci. - Sophomore goaltender Corinne Schroeder started the game and made four saves. - Freshman Nicole McGuigan played the second period and stopped four shots before classmate Kate Stuart made six saves over the final 20 minutes. - Fourteen different Terriers recorded a point. - BU killed off the only penalty it took. - The Terriers outshot the Lightning, 41-14. - The Terriers will open the 2018-19 regular season on Friday, Oct. 5, with the first of two straight home games against defending league champion Northeastern. - Puck drop is scheduled for 7 p.m.